... not if you are a mountain biker. Found this near the end of the Brody Road, about 100 yards up from Hanover Road. This wasn't there on Sunday morning when I rode through. I wonder who lost it and what were they doing? If I had to venture a guess it was trail runner because it was pretty cold Monday morning and no self respecting mountain biker would take off his (or her) gloves before a ride was finished. So, it must belong to a runner who started their run with the gloves on but towards the end of the run, hands got hot, off they came, but this one wasn't very secure and onto the trail it landed. Wasn't able to workout during lunch today so as soon as I got home, I did a superman in the garage, into my riding duds and hit the Upper Gussy on the Qball. Since I rode the Fixation on Sunday and the 'Horse last weekend it was time for the Qball to get a work out and it was a great choise for the Upper Gussy. As I mentioned in Sunday's post about riding the Fixation as rigid mountain bike and noticing the difference between having a 26er wheel up front as opposed to a 29er wheel and I could really feel the difference in the stuff I was rolling over - especially since I was riding rigid. Well, the Qball was pure heaven. The Qball handled everything on the trail nicely today. In fact I rolled through things that I chickened out on before while riding the 'Horse. Did I ever mention how well this bike climbs? I cleaned every stage on the Brody Road leading up to the Upper Gussy main trail head. Hmmm, I wonder what a geared 29er would be like? Didn't have much time to do any trail work but I did take a stab at re-routing the trail to incorporate the new stream crossing. There are some nice features in that new section including some cool rollers incorporated into the trail, as well as a nice new climb that will require quite a bit of benching, but it fits with the new stream crossing nicely and adds some more distance to the trail. 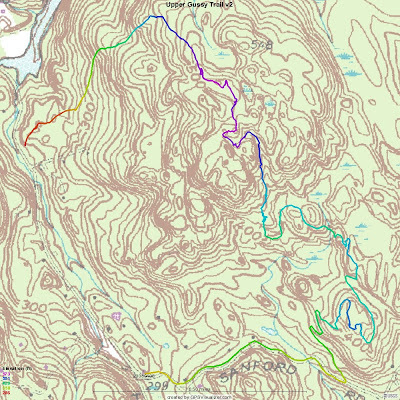 Check back tomorrow on the Upper Gussy Blog for more trail analysis on the re-routing effort. And what better way to finish the day but grill steaks and a nice stout from BBC. I have to say that I love Imperial Stout, much better than the Drayman's Porter. In comparison, the porter has too much fru-fru flavoring like coffee and chocolate. Where as, the Imperial Stout has merely a hint and no bitter aftertaste like what you get in a Guiness. Of course my favorite is now Lost Sailor India Pale Ale, and in third place is the Black and Tan. The title of this post is a quote by Nathaniel Hawthorne.